Secure, mobile VPN connections made easy! 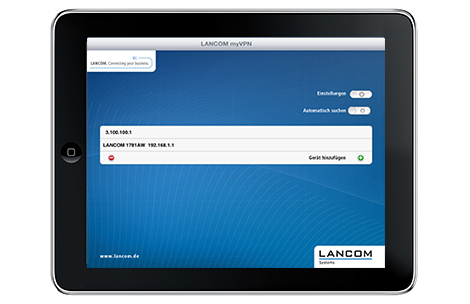 The LANCOM myVPN application facilitates the complex VPN configuration of the integrated VPN clients of iOS devices. The authentication and the VPN tunnel establishment is secured by PIN in all areas. Adjustable firewall rules guarantee a safe connection and configuration. Thanks to the intuitive interface the use is easy and comfortable. Download LANCOM myVPN in the Apple App Store! Mobile working as a matter of course. Specialized for employees who need access to their corporate network whilst traveling, LANCOM myVPN facilitates the configuration of a secure IPSec VPN connection to a LANCOM router. This enables accessing corporate data with an iOS device from external locations: Whether you are in a hotel, at the home office, or at a customer. Access your e-mails or exchange sensitive data with your colleagues. In just a few steps LANCOM myVPN configures the integrated VPN client in iOS devices. Via an easy PIN entry, the app automatically loads all configuration parameters from the respective LANCOM router. No IT know-how required - LANCOM myVPN relieves you of all configuration efforts.